If you LOVE key lime pie, you will adore these key lime pie cookies that taste just like the pie! These soft and chewy delights have key lime juice, zest and even graham cracker crumbs! Amazing! Shelly of Cookies & Cups is a pure genius I tell you. She has taken my all time favorite pie and put it in the most perfectly chewy and flavorful cookie. The recipe comes from Shelly’s brand new cookbook aptly titled The Cookies & Cups Cookbook, which is launching this week. The book is filled with the most sensational desserts (and even savory recipes) that are brimming with creativity and decadence. I actually had the hardest time figuring out what to make but boy oh boy am I glad I made these. I have had my fair share of key lime pies. I have even made key lime pie cookie cups on my site. These were just as delightful. Every element you love in key lime pie is in each bite of these. They are quite citrusy, which I adore because the lime flavor is very prominent. You don’t miss an ounce of it in these cookies. And my favorite part was the genius addition of graham cracker crumbs. They are actually inside the cookie! You would think that would make the cookies a bit harder in texture but they are so soft and chewy that you wouldn’t believe it. To top them off, Shelly decided to make them even more sensational than they already were. She added a white chocolate drizzle. Lime and white chocolate go together and should remain married forever and ever. They are the perfect pairing in these cookies. I simply cannot wait to try more recipes in Shelly’s delightful book. It is a MUST HAVE for all the bakers you know. In the bowl of a stand mixer fitted with a paddle attachment, mix the butter and sugar on medium speed for 2 minutes until light and fluffy. Add the egg, vanilla, key lime juice and lime zest and continue mixing for 1 more minute, scraping the sides of the bowl as necessary. Mix in the salt and baking soda until incorporated. Turn the speed to low and add the flour and graham cracker crumbs until the dough comes together. Roll the dough into 1-inch balls and place 2 inches apart on the baking sheet. Bake for 9 to 10 minutes, until the edges are lightly golden. Transfer the cookies to a wire rack to cool. Place the white chocolate in a microwave-safe bowl. Heat on full power for 25 seconds. Remove the bowl from the microwave and stir the chocolate. Repeat this process until the white chocolate is melted and smooth. Transfer the melted chocolate to a small ziptop bag. Snip one corner of the bag off with scissors and drizzle the white chocolate on top of the cookies. Allow the white chocolate to set completely. Store the cookies airtight at room temperature for up to 3 days. I know this is a key lime pue cookie…but can I substitute the key lime with lemons? Made these yesterday. Really, really tasty cookie! Thank you so much! Ziploc bags are fine in the microwave (by FDA guidelines). I say skip the extra dishes and nuke the white chocolate directly in a bag. These are great! I just made one for hubby and myself. YUM YOU rock! Hooray so glad you enjoyed them. I followed this recipe exactly (maybe an extra squeeze of lime or two to my batter) and it turned out wonderful and made exactly 36 cookies as well. I made these for an Easter party and people loved it! The one thing that I did differently was my topping. I did a dollop of white chocolate on the cookie with a small pinch of lime zest and then swirled it together with the back of my spoon. That way the zest stayed during traveling because it was set into the white chocolate. Plus, you get a more even bite of creamy chocolate and zest over all of the cookie. Delicious! Has anyone used coconut oil instead of butter in this recipe? I don’t think anyone has but you can definitely try it out and see if it works for you! Delicious! I really like that this recipe has graham cracker crumbs inside the batter! Hooray I’m so glad you enjoyed them! YES!!! Thanks so much hon! Anything key lime = heaven in my book Jocelyn! Count me in for at least a dozen of these beauties! 11. I have to watch my sodium, so I’ll use UN-salted butter unless you think there’s a reason it needs to be salted in order to bake right. 2. Can I use ordinary table salt in place of kosher? I’m on a budget and kosher is a little high price for me. Hi Jan, you can definitely eliminate the salted butter for these and they will be just fine! I baked these today, well still finishing up batches as I write! These came out slight golden crunch on the edges and soft in the middle (PERFECT)! They are super delicious and not over powering with lime at all! I will keep baking these! Thank you so much for sharing this recipe. I am a picky foodie! Wonderful! I’m so glad you enjoyed them! Perfect cookies for a hot sunny day!! These cookie make me wish I was on a Caribbean beach. Yum! I so absolutely need to try these! I love everything lemon and lime these days! These beauties are calling my name! I love anything with lime or lemon! Thank you Jocelyn for a beautiful cookbook and fun blog and yummy recipes!!!!! I love Key Lime Pie, and these cookies are awesome, especially with the white chocolate! Oh I agree! Shelly has the best cookie recipes. I do love the white chocolate drizzle in these. I am going to have to just buy her book already. These cookies sound awesome! I like the addition of graham cracker crumbs. 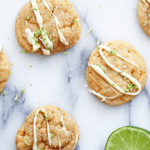 Key Lime Pie is my favorite…..and in cookie form? Love. I’m already excited over here. I mean, graham cracker crumbs IN the cookie?! Wow. Can’t wait to buy the book, too! Key lime pie in cookie form? Heck yeah, pass the plate!! I love graham cracker crumbs in cookies…it adds such a fun taste and texture! 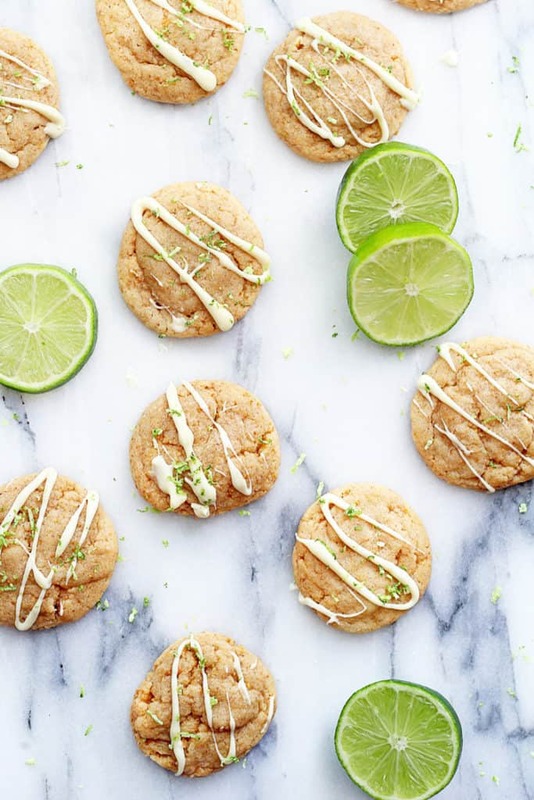 These key lime pie cookies look and sound amazing! Love the extra white chocolate drizzle! I love these! They look amazing. I have a thing for zesty cookies, and the graham cracker crumbs… that’s just genius. I want! Key lime pie is the way to my heart…in any form! These cookies are calling my name! These cookies are gorgeous! Love the drizzle and all the zest 🙂 Lime is the best! Cookies that taste like pie? Sign me up! Oh, that white chocolate drizzle is a great addition to these already epic cookies. Yum! It definitely added to the awesome flavor! I would have to stay far away from them because I would eat them all! They look soooo good and chewy AND white chocolate on top! I was thinking about getting her cookbook. This recipe is really tempting me to buy it now! Indeed! I hope you enjoy it. I fear I would eat them all. In one sitting. And not feel the least bit guilty. 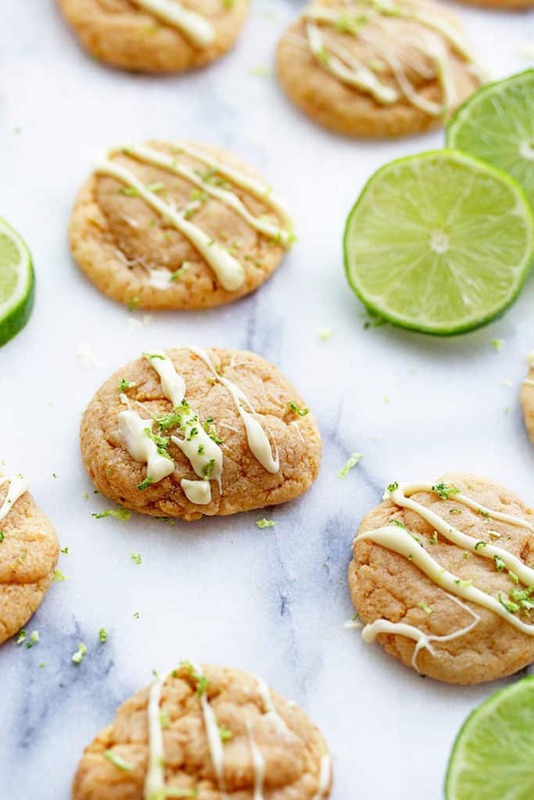 Key lime pie cookies are a phenomenal idea! They are the best idea ever girl! These look delicious! I’ve made cookies with graham cracker before and they are sensational! Gosh aren’t they? I am totally going to add graham cracker to more cookies! And I thought key lime pies were mind blowing! These look so super decadent!!!!! I love it!